Shun's Knife Care Kit has the tools to help maintain your Shuns in their best condition. 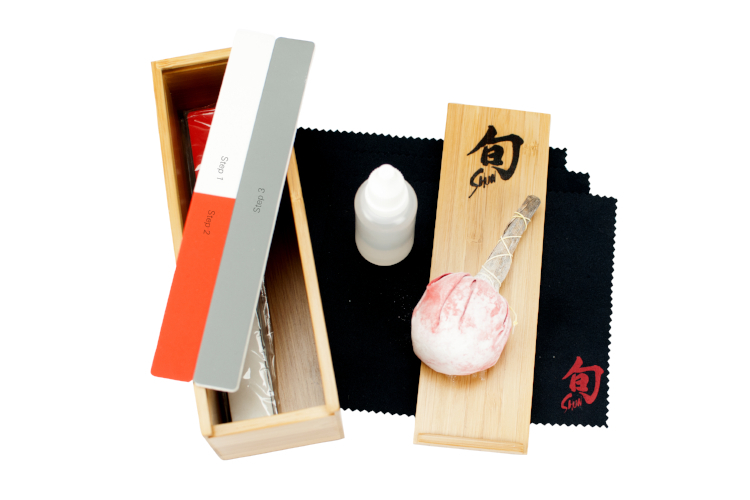 The kit provides a variety of polishing cloths and sticks, a Japanese-style talc ball, oil, storage box and instructions. This kit helps you deal with natural tarnishing, discoloration and even surface rust. Shun advises that preventative maintenance is best with their simply daily care routine: use proper cutting technique, cut on an appropriate surface, hand wash in mild detergent, dry thoroughly with an absorbent towel and allow to air-dry before storage. The Shun Knife Care Kit is your best line of defense along with the thoughtful preventative care.